Closure Lite - Just in time for Christmas! When I was an undergrad at MIT, the end of the fall semester meant I had about 5 weeks of freedom to hack on stuff before the start of the spring semester. At MIT, instead of starting classes back up in January, they have what is called the Independent Activities Period (IAP). Although IAP is optional, many students return for it (except the Hawaiians I knew, who generally decided to stay home in their tropical paradise during one of the coldest months in Boston) because there are so many great opportunities: you can get scuba certified, do research, or my personal favorite -- engage in programming competitions! I hope that both Closure and Closure Lite are useful to MIT students who are competing in 6.470 this IAP! Last night, Google hosted a Campfire One event introducing Google Web Toolkit (GWT) 2.0. The Campfire event is divided into six segments that are all available on YouTube. Then in Part 5, Kelly Norton introduces Speed Tracer, which is a Chrome extension that gives an unprecedented amount of insight into what Chrome is doing when it runs a web application. It is more similar to dynaTrace than it is to Firebug. Page Tracer is informative and so snappy that you might not believe the UI is written in HTML5 -- try it out! However, my one gripe with the Campfire presentation is that you might come away from it believing that Speed Tracer works only with GWT applications, but that is not the case at all! Although its documentation lives under GWT on code.google.com and Speed Tracer was written using GWT, it can be downloaded and used completely independently from GWT. This morning, I installed it to explore the performance of some webapps I used to work on (which were written using Closure), such as Google Tasks. (I found some areas for improvement which I forwarded to the team.) I strongly recommend evaluating your own web applications using Speed Tracer as you may be surprised at what you discover. Also, if you're like me, you may not notice the links to additional Speed Tracer documentation because they appear below the fold on the landing page. Under the Tools heading in the left-hand-nav, there are links to Hints, the Data Dump Format, and the Logging API. If you stop and think about it, this level of tool support is essential for the Chrome OS initiative to succeed. If the browser is going to substitute for the desktop as a platform, then it must be fast (which is where Chrome comes in), it needs to have a kickass API (which is where HTML5 comes in), and it needs to have best-of-breed developer tools (which is where GWT, Closure, and Speed Tracer come in) so it is possible to build web applications that can compete with (and ideally exceed) desktop applications. When Chrome OS was originally announced, I was a naysayer, but now that more of the pieces are starting to come together, I'm getting a bit more optimistic. Today I gave a guest lecture on Chickenfoot to Monzy's course on mashups at NYU's Tisch School of the Arts. The presentation is available online as a Google Doc. Unlike previous talks on Chickenfoot, this one focused on practical examples of how to use it rather than the research behind it. This was a nice change because I actually got to sit down with a classroom full of first-time users of Chickenfoot as they went through the exercises. Thanks to Monzy and his students at ITP for having me! Kai found some missing items in my Maps V2 externs file. I was missing methods from the following classes: GControl, GMapType, GMarker, GProjection, and GTileLayer. I also apparently missed GPolyline.fromEncoded() and GPolygon.fromEncoded() because they were listed under Factory Methods, which my script did not know to look for. Apparently Kai has also found an inconsistency between the online documentation for GPolyline.fromEncoded() and its implementation, but I want to get someone from the Maps team to confirm before updating that. Special thanks to Mihai and Kushal for reading drafts of the inheritance article. For example, slide 12 shows some sample code that calls Extends("com.xopus.code.Animal") which has no apparent reference to the class doing the extending, so it is hard to imagine how calling Extends() has the side-effect of providing Animal's methods to Monkey. Presumably, the compiler treats Extends() as a preprocessor directive whereas Closure's goog.inherits() will actually add the superclass's methods to the subclass's prototype. 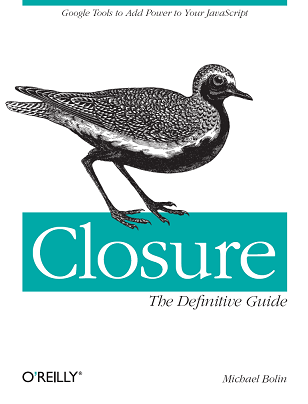 Closure generally relies on annotations, such as @extends, for compiler directives rather than function calls. Closure code should always be executable in both raw and compiled modes. * @return The compiled version of the code. // Advanced mode is used here, but additional options could be set, too. // CompilerRunner.getDefaultExterns() should be used here. // errors will cite line numbers in terms of input.js. // compile() returns a Result, but it is not needed here. // accessible via the Result. This is packaged in a runnable example in CallCompilerProgrammaticallyExample.java. Note that the recommended way of extending compiler behavior is to subclass CompilerRunner (most likely createOptions() will be the method you are interested in overriding). Your subclass should have a main() method and be set as the Main-Class in a jar. Such a jar can then be used with the -c option in the calcdeps.py utility. an adapter with an NES port on one end and a USB port on the other. No soldering required! Since the "USB NES RetroPort" costs $19 and a used NES controller only costs $3, it seemed like a good idea to buy a couple of RetroPorts and a stack of controllers so I can just swap in new controllers when the buttons wear out. I bought some hardware (the guy who runs retrousb.com was very helpful) and started playing with different emulators to see which ones would support my new controllers. I learned that many emulators do not let you configure your joystick directly; instead, you are expected to install JoyToKey to convert joystick input to keyboard input and then map your joystick to the key commands required for your emulator. Honestly, it worked fine, but I wanted an all-in-one solution. On Windows, VirtuaNES worked quite well and had support for configuring controllers, but the web site was in Japanese, so it took me awhile to figure out how to do that. Once I confirmed that my controllers were working, I started looking at emulators for Mac because I wanted to rekindle my project from over two years ago of using a PowerPC Mac Mini as my NES emulation hub. Emulator options are much more limited on Mac. I started out by looking for emulators written in Java, since those should be cross-platform. I took another look at NESCafe (which I reported did not support sound in 2007, but seems to now), but as far as I could tell, it only supported one controller, so that was a deal-breaker. Then I took a look at vNES, which seemed much more promising, except for this FAQ that claimed for reasons unknown, it would not work on a PowerPC Mac. If you look carefully, you'll see that although there is a check to determine whether mixerInfo is empty, it uses mixerInfo for no documented reason. When I looked at the mixerInfo array, I discovered it only had one value on my PowerPC Mac Mini, two values on my Intel Mac Mini, and nine values on my Vista Thinkpad! I changed the code to use mixerInfo and all was well. Although I got vNES working on my PPC Mini, it was prohibitively slow. Since I had already been playing around with the source code, I considered trying to optimize it, but because of the "no comments in the source code" thing, I realized that could take days. Instead, I went back to Nestopia. Richard Bannister's Nestopia is a solid emulator for the Mac. It runs at full speed on the PPC and looks great when output to my flatscreen TV. The sound works, both of my controllers hooked up via my RetroPorts work -- this is the real deal. The only thing it doesn't do is take the path to the ROM as a command-line option, and this is what kept me up past 4am last night. You see, I want to build a Cover Flow UI on top of the emulator for selecting the game to play. To do that, I need to be able to programmatically open Nestopia with a particular ROM file. Martin Freij has generously agreed to license Nestopia to me under a closed-source license for the present. As soon as I have my API kit ready, a buildable version of Nestopia will be released with my shell library. The license for this has yet to be decided but most likely will be normal GPL with my shell excluded under section three of the license. This has been postponed repeatedly due to lack of time but will be released one day - honest! That dates back to September 27, 2008, so I wasn't going to hold my breath waiting for the source to be released. Besides, from his list of projects, Richard seems to have a lot going on, so I can imagine that he doesn't have the time for this sort of thing. Regardless, I want my Cover Flow! Because I couldn't change the code for Nestopia, I tried to automate it with AppleScript instead. This is when I should have put the coffee on. According to Google Web History, I did over 100 searches last night while developing my script. -- Click the "Maybe later" button when asked to register. -- Cancel the "Quick Start" mode using the Escape key. -- but it's useful to have when not using this script. -- Hit command+shift+G to get the "Open Folder" dialog. The part of this script that is particularly gross is the logic with the "Open Folder" dialog. Nestopia displays what appears to be a standard "File Open" dialog, but I could not, for the life of me, figure out how to script it. As you can see, I resorted to using key and mouse events to type in the value I wanted, and had I relied on this, I would have had to have an individual folder for each ROM because Finder (at least on 10.4.11, which is what my PPC Mini runs) lets you type in folder names, but not path names. If there are any AppleScript masters out there, I'd be very curious to see how else you would do this. # let's get this out of the way before we forget! my $folder = 'of folder "roms" ' . 'of folder "nintendo" ' . 'of folder "Documents" ' . 'of folder "WebServer" ' . 'of folder "Library" ' . my $cmd = "osascript -e 'tell application \"Finder\"' " .
" -e 'open file \"$rom\" $folder' " . It took me at least half an hour of Googling until I came across a solution for passing in the file path as an argument. Apparently AppleScript only deals with HFS paths instead of POSIX paths like everyone else. It is particularly frustrating that Script Editor allows you to write POSIX file "/Users/bolinfest/drmario.nes", but as soon as you compile the code, it becomes file "Macintosh HD:Users:bolinfest:drmario.nes". What kind of editor rewrites your code into some kind of unmaintainable equivalent when you compile it? User input should be able to be simulated using native key and mouse events. Tests should be able to run in multiple browsers and on multiple platforms. Tests should not hardcode XPaths, element ids, or CSS class names. Test suites should be able to be run via a cron job. I discuss the properties in detail, give an example of a system that exhibits most (but not all) of the properties, and then ask browser vendors to come in and save the day. The thrilling conclusion to "Do you remember SAT math?" Two weeks ago, I posted two SAT-style Quantitative Comparison questions. This week, I am posting the solutions (sorry, I know it's a bit late). If we let the radius of the inner circle be r and the length of segment BC be s such that the radius of the outer circle is r+s, then we can express all the quantities that we are interested in in terms of r and s.
When comparing each pair of terms, the ½πr cancel each other out. Because s is a length, we know that s>0, which means that ½πs is always greater than s, but is always less than 2s. In terms of answering the quantitative comparison questions, this means the answer to the first question must be A and the answer to the second question must be B. 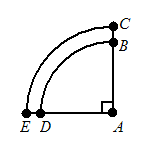 Put another way, if you are walking around a 90 degree arc (such as from point C to point E), it will always be faster to walk around the outer arc than to walk to an inner arc, traverse it, and return to the outer arc. What is particularly interesting is that this is true regardless of the radius of the inner arc. Now before you start taking the outside edge of every curve, note that this only holds true for arcs less than a certain size. For example, what if it you were traversing a semicircle instead? Plugging that into Google Calculator, we see that x is ~0.318, so once you're walking more than a third of the way around a circle, it makes more sense to move to the inner arc. Also, this question is resistant to some common SAT-solving techniques. For example, for geometry questions where the figure is to scale (such as this one), The Princeton Review will tell you to make small marks on your answer sheet so you can use it as a ruler, but because this problem involves arcs, that is of little help. Another common SAT tip is to redraw the diagram, exaggerating r or s, but if you play around with that, you can probably convince yourself that there are cases where one quantity is larger than the other, but it's hard to say conclusively that it holds true for arbitrary values of r and s.
That means the only ones who will be answering the question correctly are those who can do the math. Isn't that how it should be? It's time to add baseball schedules to Google Calendar! Each calendar will be updated automatically – I have a script that runs twice an hour while baseball games are on (it gets a break from 3am-noon eastern time) to scrape the latest data and update all of the calendars. Unfortunately, I don't think the calendars will be re-indexed that quickly by Google Calendar, but it's better than nothing. P.S. If you have that problem where the popup with the arrow pointing to Tasks appears every time you log into Gmail: (1) I apologize, and (2) if you click on the Tasks link that it is pointing to, the popup should never show up again. Tell your friends! "Who still uses quirksmode?" you might ask. Well, for legacy reasons, iGoogle gadgets do. I thought that OpenSocial fixed that, but item 6 of the spec says otherwise, though the discussion group suggests a distasteful workaround. Either way, this whole doctype thing is a problem. On a web page, the document has a doctype property, but it's read-only, so trying to edit that is a dead-end. Originally, I tried manipulating the content of an iframe with src="about:blank" which I thought would be clean because it had no content, but no content means no doctype, so it is also stuck in quirksmode. One thing that is particularly advantageous with this technique is that if your widget requires its own stylesheet, it can load it in the iframe instead of the top-level page where your CSS class names run the risk of conflicting with the CSS class names used in the host page. So even if you know that your widget is going to be used in a standards-compliant page, you may want to use this technique to create a "fresh namespace" for your CSS. Overall, I am still pretty happy with this solution, though one thing that occurred to me is that this is a little frightening with respect to phishing in that a malicious web page could easily display an iframe to foreign content (that is familiar to you) and then display its own login box or credit card form on top of it to lure you to enter your information. I mentioned this to Mihai, and he said this is somewhat of a known issue, citing this example at zombieurl.com (warning: page contains sound). I guess that goes to show that you can never be safe from zombies, not even on the Internet.